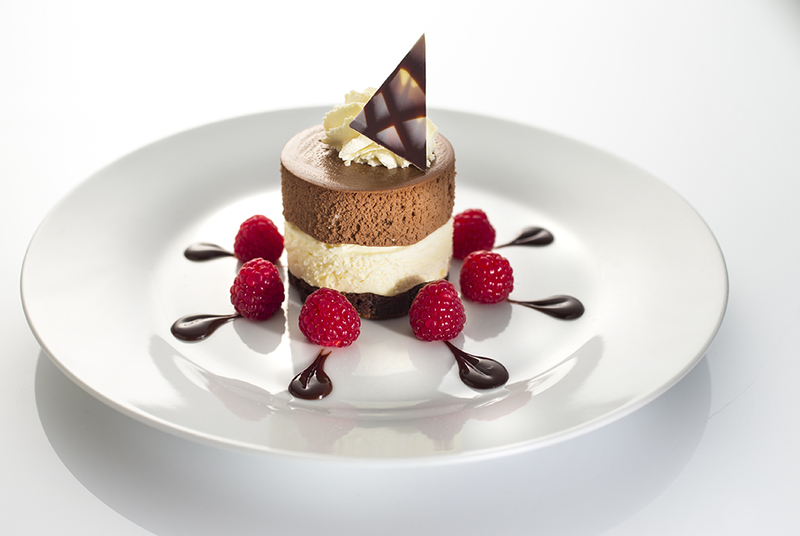 Mousse, tortes and bavarois supplier : Fresh handmade quality desserts for the catering trade. Our chefs have taken great care in creating this versatile range of desserts, all full of flavour and made with good quality pure ingredients. All with no added artificial flavours or preservative. Our selections come in a wide range of styles and flavours on various textured bases. This is our take on the classic flavours, consisting of a chocolate sponge topped with a duo of Belgian chocolate and coffee creams & finished with cream, chocolate curls & ameretti biscuit crumbs. Handmade Belgian chocolate teardrop filled with a dark chocolate mousse with a salted caramel centre. Use your imagination to plate this dessert! Each portion consists of a Belgian chocolate brownie topped with chocolate mousse and pistachio, a vanilla pannacotta and a zingy lemon cheesecake with a biscuit crumble (comes in tubs for you to serve as you like). Belgian chocolate mousse on a biscuit base surrounded by vanilla boudoir biscuits. 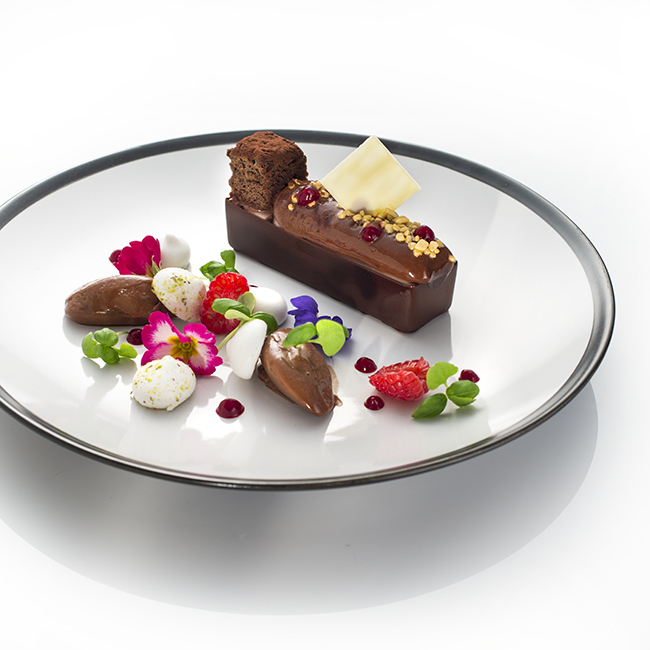 Milk chocolate mousse set on a chocolate crunch base served with a honeyscotch sauce. Belgian chocolate mousse topped with assorted nuts and rum soaked raisins. Swirled chocolate & peanut butter mousse, set on a sponge base finished with grated Snickers bars. Three layers of chocolate sponge drenched in Kahlua sandwiching a dark chocolate mousse. Warning. Very strong in Kahlua!! A chaotic mix of white and dark Belgian chocolate mousses, chocolate brownie, on a sponge base finished with more brownie and chocolate chips. Rich Belgian chocolate mousse on a sponge base lavished with marshmallows. Indulgent layers of white, dark & milk Belgian chocolate mousses. Layers of Belgian chocolate mousse and pecan caramel on a chocolate sponge base. 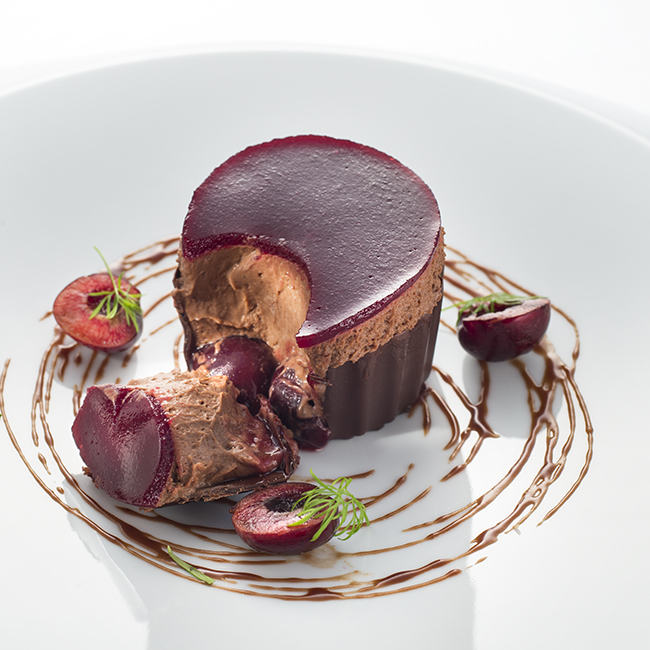 Layers of chocolate sponge soaked in kirsch syrup with Belgian chocolate mousse & cherries. Dark Belgian chocolate mousse with rum soaked raisins with a top and bottom of buttered crushed amaretti biscuits. Classic dark Belgian chocolate mousse set on a sponge base dusted with cocoa. Orange cheesecake topped with a Belgian chocolate mousse on a gluten free brownie base. Sponge base soaked with rum syrup with Belgian chocolate mousse and garnished with a chocolate rum cream. 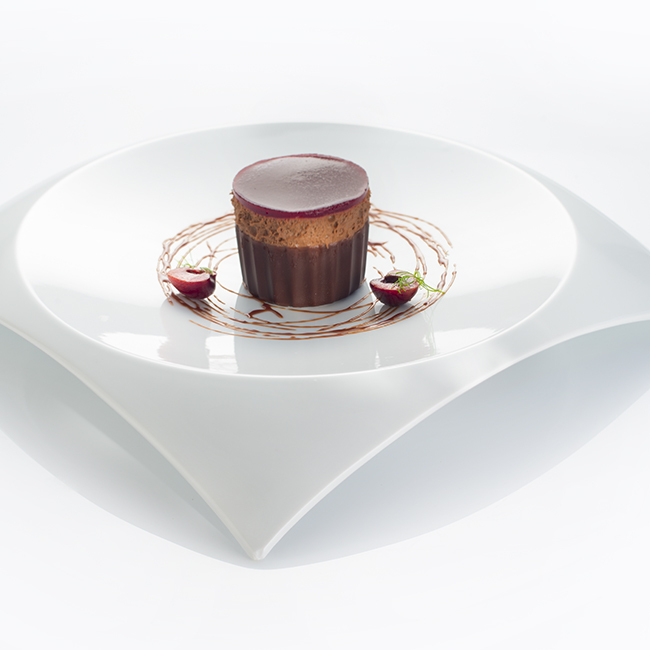 Chocolate cup filled with a cherry compote and chocolate mousse, finished with a cherry glaze. Duo of dark chocolate and strawberry mousses on a chocolate sponge base topped with a white chocolate & strawberry truffle. 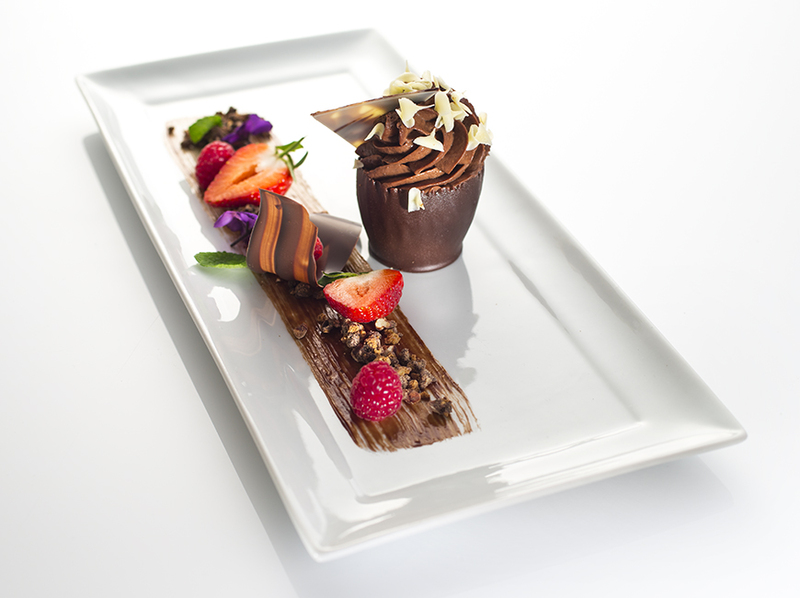 Dark chocolate cup with a jaffa orange jelly finished with piped Belgian chocolate mousse and shavings. Rectangular chocolate cup filled with raspberries and raspberry mousse, topped with a brownie cube & Belgian chocolate mousse. A duo of rich white and dark Belgian chocolate mousses on a sponge base with chocolate chips. A biscuit base with Belgian chocolate mousse and topped with chocolate confectionary and chocolate shavings. Sponge base soaked in amaretto syrup topped with Belgian chocolate mousse centred with praline and finished with hazelnuts. Belgian chocolate mousse on sponge base with peanut butter cheesecake swirl, finished with peanuts & chocolate sauce. Chocolate sponge base with Belgian chocolate mousse topped with a ball of cheesecake, drizzled with ganache and melted Snickers, then sprinkled with peanuts. Crunchy praline base with Belgian chocolate mousse, then dressed with nuts. Belgian Chocolate mousse sandwiched with two layers of lemon soaked sponge finished with cocoa and a chocolate triangle. Chocolate mousse on a crunchy base piped with a ball of mint choc chip cheesecake and garnished with mint sticks. Chocolate sponge soaked in Cointreau syrup topped with a Belgian chocolate and orange mousse. White Belgian chocolate mousse with a centre of raspberry finished with a raspberry glaze. Layered Belgian chocolate and toffee banana mousse on sponge base with banana chips. Belgian chocolate and vanilla mousse layers with a strawberry and set strawberry puree. Sugared chopped hazelnuts and ganache in the middle of Belgian chocolate mousse topped with ganache and more hazelnuts. Pecan, toffee bavarois set on a vanilla sponge base surrounded with boudoir biscuits and swirled with chocolate. Vanilla mousse on a sponge base accompanied by a blueberry compote. Light mango mousse on a vanilla sponge base jewelled with passion fruit jelly pieces and topped with a mango puree. 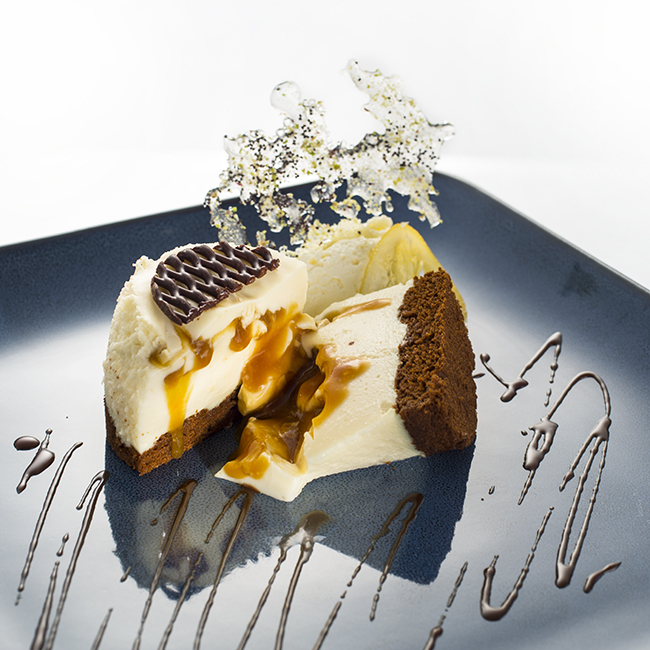 Ginger mousse swirled with miso caramel on chocolate sponge, decorated with a chocolate lattice. Dark chocolate cup filled with an espresso and amaretto mousse finished with an amaretti biscuit. A peppermint cream spiked with chocolate on a chocolate sponge base finished with chocolate shavings. Taken from the traditional biscuit. 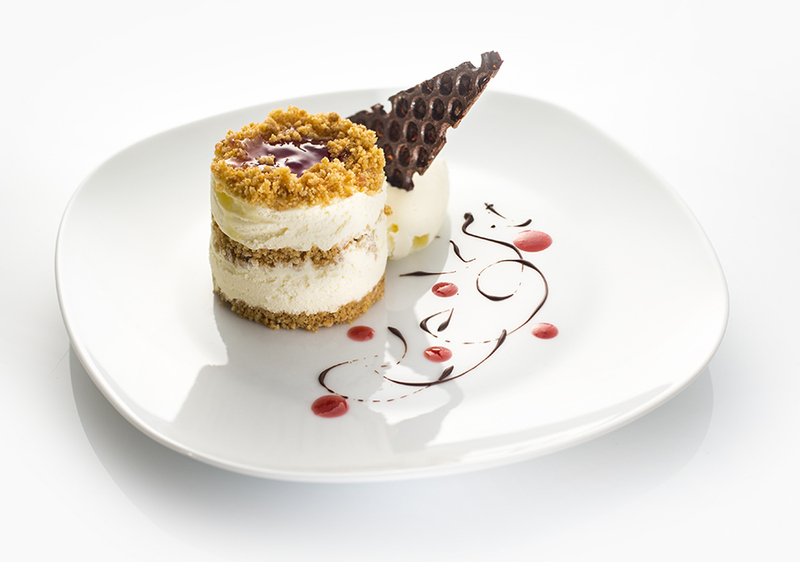 Digestive biscuit base topped with a vanilla mousse, finished with a ring of crushed biscuit centred with jam. Layers of peach & blueberry mousses on a vanilla sponge base, topped with cream & peach. Rhubarb mousse topped with a set custard on a vanilla base, accompanied by a rhubarb compote. Vanilla and elderflower mousse swirled with raspberry puree, dusted with icing sugar. A zingy layered combination of vanilla sponge soaked with lime syrup and lemon curd cream, topped with sweet meringue disk dipped in chocolate ganache. A lemon bavarois set on a sponge base topped with zingy lemon and lime. Vanilla cream on a sponge base topped with raspberries and raspberry puree. Rosewater and pistachio torte on a vanilla sponge base decorated with chopped pistachio. Apple mousse on a vanilla base centred with blackberry compote, finished with a slice of fresh glazed apple. Lemon mousse with lemon curd garnished with whipped cream and lemon zest. Chocolate and orange bavarois surrounded by boudoir biscuits, finished with glazed mandarins. Coffee and Irish cream mousse topped with soft whipped cream and cocoa. Layers of coffee & ameretto soaked sponge between mascarpone cream. Banana and coconut mousse flavoured with rum on a sponge base topped with craquant and banana chips. A simple classic raspberry mousse set on a vanilla sponge base topped with a raspberry mirror glaze. Caramel bavarois on a sponge base with a caramel glaze. Caramel bavarois with a salted caramel centre & topped with soft piped cream. with a crunchy crumble top. Vanilla mousse with raspberries & raspberry swirl & topped with glazed peach half. A coconut lover's delight! A rich creamed coconut mousse topped with a dark chocolate ganache.